There are a lot of swimming health benefits that people are eager to dive into. Chances are you’ve taken a course on swimming and learn how to swim, but you may want to swim faster freestyle or hone your techniques. One great way to improve the strength in your arms and shoulders to make you a stronger swimmer is to use swimming gloves. Swim gloves can make you stronger and adjust or improve your swimming techniques. Everyone can use swimming gloves from beginners to trainers and professionals. However, not all swimming gloves are created equal. It can be hard to decide which design best suits your needs, wants, and swimming abilities. Our guide gives you the top picks for the top rated webbed gloves, which will allow you to train better, track your swim workout, and prevent swimming shoulder injuries. These Aqua Fit Swim Training Gloves are made of neoprene and have webbed fingers and a rubber palm. They have an adjustable wrist closure to keep them secure to your hands. They have flexible webbing for water resistance training. They can increase your propulsion through the water, which makes for a better upper body workout. They can be used for aerobics and pool workouts. These are top rated webbed gloves that are made of neoprene for top water resistance training. They will help tone and strengthen your muscles. They have webbed fingers and an adjustable wrist closure. You can increase your propulsion through the water with smoother movements. They are comfortable and have 4-way stretch. These Aquatic Gloves offer great water resistance for a better upper body workout to tone and strengthen muscles. They are easy to get on and off with the adjustable wrist strap. There are a variety of sizes available: with Small, Medium, and Large offered for different sized hands. They are well built and made of neoprene. They have strong stitching and won’t fade. TAGVO also ensures they have a 100% Refund Promise if the product does not exceed your expectations. These Aqua Fit Swim Gloves are made of sponge and nylon. They help increase your water and underwater forward speed in water. With the increased resistance you can build your strength. 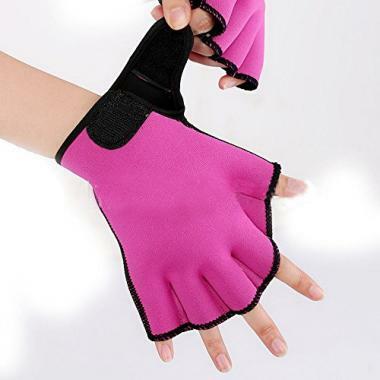 They maintain the mobility of your hand and are fantastic for aerobics classes. These swimming gloves will improve your paddle speed. They have a 3D web profile that increases your hand’s surface area by 70%. They are ultra-thin and act as a second skin. They allow your fingers their dexterity. You can get these gloves on and off with ease by using a silicone lubricant spray. They can be turned inside out to be removed. They should fit tight but feel comfortable like a wetsuit. 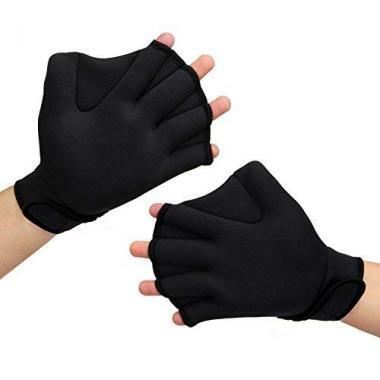 These are a 2mm thick glove that are made of black lycra. They have a sharkskin palm and Velcro strap. These are made of soft and pliable neoprene. They are webbed swim gloves that are easy to put on with the Velcro wrist. They are designed to help you train with resistance and increase your distance per stroke. They will help tone and strengthen your muscles. These are made of high-quality neoprene. It is a soft material that fits to the skin but allow your hand it’s movement and dexterity. They can be especially helpful to arthritic hands. They have an adjustable wrist closure. They have five fingers and a won’t store too much water. This pair of Webbed Swim Gloves are designed to increase resistance and build your strength. They are constructed of flexible neoprene. 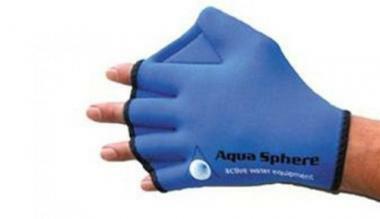 They are available in the sizes S, M, and L. Aqua Sphere also includes a Two-Year Limited Warranty. These neoprene gloves stretch for a great fit. They have a little elasticity for a comfortable fit. They will help tone and strengthen your muscles. The webbed fingers will help increase your propulsion through the water. 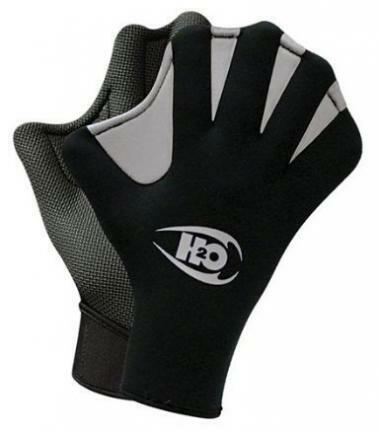 The open finger design gives your hand flexibility and breathability. They have a hook and loop wrist closure and are easy to wear and remove. Whether you are training to be faster, learning how to increase your lung capacity, wanting to experience open water swimming, or just want to increase your strength and skill, swim gloves are a great training tool that can boost you to the next level. Aquatic gloves work by adding a small level of resistance as you carve your way through the water. Mimicking animals that have webbed fingers and toes, a pair of swim gloves makes it harder for your hand to push through the surface of the water. This level of resistance works your muscles and can teach you how to swim with perfect form. It can be a challenge to decide which swimming mitts are the best for you because there are a lot of different options. Not all swim training gloves are made for all levels of swimmers and you should be aware of a few key features before you make a purchase. Here, we break down specific features that can help you determine which swimmers gloves would best suit your needs. We’ve complied all the information you need in one place to make it easier for you, so you can get back out in the water and train. It is extremely important that your gloves for swimming fit your hands correctly. You don’t want a glove that is too small or too large, because both ends of the spectrum can cause problems and make for a frustrating training session. 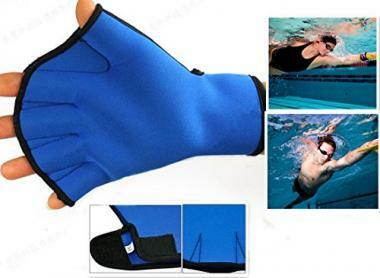 Swimming mitts that are too small will be uncomfortable for your hand. The gloves add resistance and force you to use more strength with your arms to push yourself through the water. Webbed swim gloves that are too small can cut into the skin or rub your hands the wrong way. At the end of your training session, you’re likely to be more frustrated than satisfied. 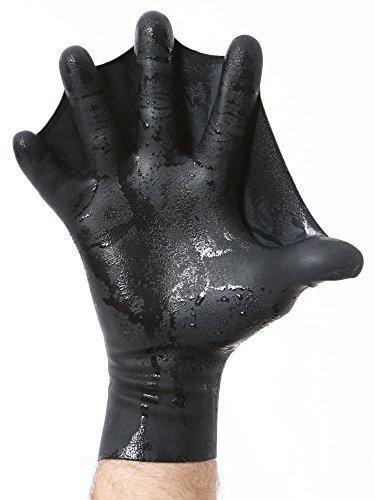 If the gloves for swimming are too large, they likely won’t work either because they will slip and slide around the hand too much, which means you aren’t able to use the proper swimming techniques. You may even lose swim gloves that are too large because they slide right off your hands. The best aquatic gloves will fit just right. They won’t be too restrictive on your hands, but they will be snug enough that they are able to resist the water and do their job in training your muscles. Water is strong and by using a pair of swimming mitts, you will add a lot of resistance to your hand, which means more force is necessary to propel your way through the water. This also means that your webbed swim gloves need to be durable to withstand repeated use and heavy resistance through the water. It would be frustrating to be in the training mode, only to have your gear break on the first use. The best swimming gloves will be durable enough to withstand the water and multiple training sessions. Like swim caps and swimming googles, swim training gloves are accessories used for swimming. You may be familiar with swim fins, which are used on your feet and offer resistance and better swimming. Instead of your feet, swim gloves will mostly be used as a training tool to strengthen your shoulders and arms. They can also help you learn proper swimming form. Swimmers who use aquatic gloves would like to better their time, strength, or form in the water. Swim training gloves are versatile and there are designs for all levels of swimmers. From beginners to professionals, there should be swimming mitts that will suit your needs and excel your training. Most swim gloves can also be used in swimming pools, in lakes, or in open water. It is best to use swimming mitts where you feel most comfortable. There are a few different types of swim gloves. 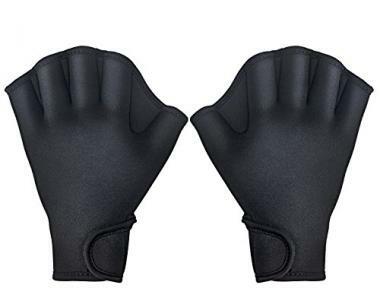 Most swim gloves will feature webbing that connect your fingers together. However, there may be some designs that are closer to swim paddles where there is a hard piece that is worn around the hand to give resistance in the water. Most swim gloves will have a design where each finger has a part of the glove to go into. The webbing is between the fingers. When you spread your fingers, the webbing is expanded and with that, is the resistance in the water. Most swimming mitts will be made of a waterproof material. Waterproof swimming gloves will do the best because they are meant to be submerged in water. A popular material is neoprene. Neoprene is most famous for the material that wetsuits are made of. Neoprene is a great material because it is protective to your hands and it is durable, as well as long lasting. Neoprene will easily withstand the water resistance and can help you train throughout multiple sessions through the years. Neoprene is sturdy, but also flexible enough to allow your hands movement through the water. Your waterproof swimming gloves should deliver top performance. The better your aquatic gloves are in their performance, the better you will be in your performance. Since swim gloves are used for training, the better you train, the better your outcome is likely to be. This means that the best swimming gloves will give you the best performance. You will likely have more endurance and strength for swimming if you train with swimming mitts. Q: What are the benefits of using swim gloves? A: Strength. By training with swim training gloves your body will be stronger in the arms and shoulders. This can help perfect your form, give you better endurance, and have you swimming faster. Whether you are training to swim laps in a pool, in a lake, or in open water, you can benefit from the use of swim training gloves. Webbed swim gloves are used to make you a better swimmer. It doesn’t matter if you are a beginner, trainer, or professional, a pair of top rated webbed gloves can elevate and enhance your performance in the water. Q: How to clean and maintain my swim gloves? A: The best way to clean and maintain your swim gloves is to check for any brand specific cleaning instructions or information. Likely, brands will include a user’s guide or manual that also provides information on how best to care and wash your swim gloves. 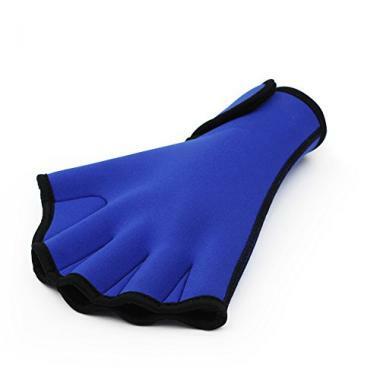 In general, swimming gloves should be able to be spot cleaned or hand washed with a mild detergent and water. You’ll have to check to see if any can be washed in a washing machine. You wouldn’t want to cause accidental damage. 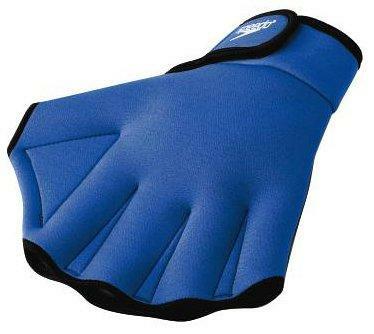 You may also check swimming gloves reviews to see how other users have cared for their swim gloves. You should always remember to allow your swimmers gloves to fully dry before they are stored. This will help you avoid damaging mold, rot, or mildew. If you are ready to take your swimming performance to the next level, then consider investing in a pair of top rated webbed gloves. When used consistently as a training tool, your arms and shoulders are guaranteed to be stronger and you can work on your swimming form. 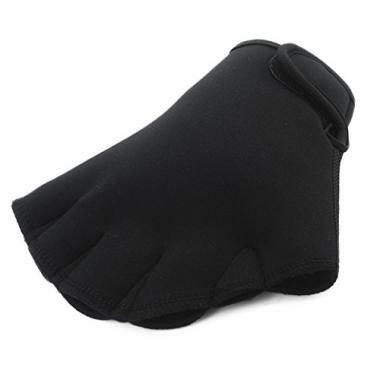 Swim gloves are a popular swim accessory that are useful to swimmers of all levels. If you know exactly what you are looking for, you can save time and money by investing in the best swimming gloves. Just don’t forget that after a hard training session, you’ll want to quickly recover from swimming and care for your body. This way, you’ll always be ready to deliver top performance. Do you own one of the pairs of swim gloves that made it onto our list? Let us know how it has worked for your swimming needs in the comments section below.